The discussion on the alleged homosexuality of Paul VI continues. Recently we were asked to produce evidence for the hypotheses raised in an article on our site. Today we reproduce an important document. 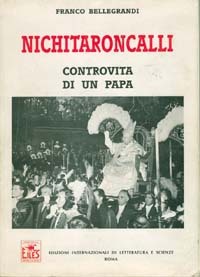 It is a part of the book Nikita and Roncalli - Unknown Aspects of a Pope by Franco Bellegrandi on the Pontificate of Pope John XXIII. 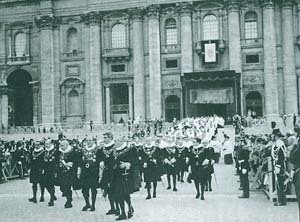 Bellegrandi was an insider at the Vatican from the end of Pius XII's reign to the beginning of Paul VI's. 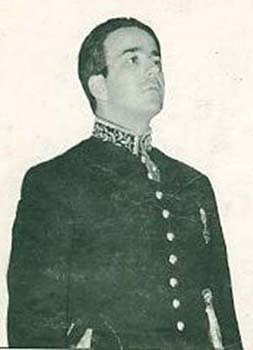 He was a member of an honor guard of the Sovereign Pontiff - camarieri di spada i cappa [honor chamberlains] - which along with the Noble Guards were in charge of services of honor for the Pontiff: introduction of heads of State, ambassadors, or other high level visitors, assisting the Pontiff at solemn events and private audiences. Bellegrandi has further credentials that give him credibility: When he left his post of service for the Pope, he was chosen to be a correspondent of L'Osservatore Romano, the daily paper of the Holy See; he became a professor of Modern History at Innsbruck University, Austria; and he was decorated with the Golden Cross of Merit of the Austrian Republic. He is the author of two other books on the Vatican. Bellegrandi reports what he saw and heard during his term in the Vatican. Top right, the cover of Nikita and Roncalli. Below, we present our translation of the highlighted Italian excerpts of the book. Below the Italian text at right, some pictures of Bellagrandi and the honor chamberlains. In Rome and throughout Italy the rumor is out that Montini would be a homosexual. Hence, vulnerable. Hence, open to those who aim to use him to achieve their own goals. 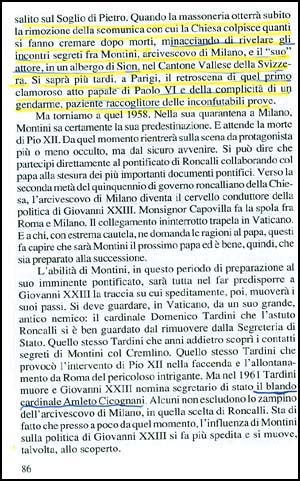 When he was Archbishop of Milan, he would have been caught by the police one night wearing civilian clothes and in suspect company. Actually, for many years he had a special friendship with an actor who colors his hair red. This man did not make any secret of his relation with the future Pope. The relation continued and became much closer in the years ahead. [After Montini was elected Pope] an official of the Vatican security forces told me that this favorite of Montini was allowed to come and go freely in the pontifical apartments. And that he had often been seen taking the papal elevator at night. The "banana skin" that Paul VI slipped on and that put an end to the non-official nature of his weakness was the homily on sexual ethics he delivered in January 1976 dealing with some points on homosexuality. This homily provoked a reaction from the French writer Roger Peyrefitte. 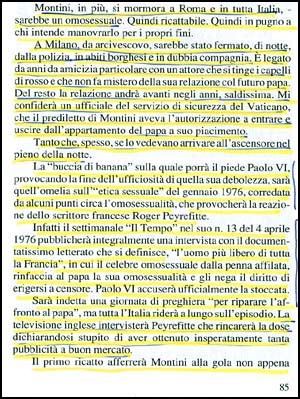 On April 4, 1976, the weekly Il Tempo published an interview with the author, who has the reputation for very good documentation … He accused the Pope of being a homosexual and denied his right to be a censor on the topic. 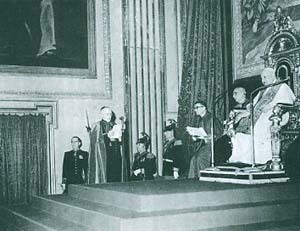 Paul VI officially acknowledged the blow. A day of prayers "to make reparation for the offense received by the Pope" was called for. All of Italy, however, was laughing about the incident. British TV made an interview with Peyrefitte, who confirmed his accusations and expressed surprise over the publicity he was receiving. 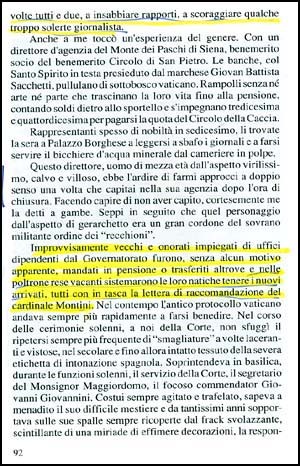 Another change observed by those in that narrow circle who, because of their rank or their posts, used to pass a large amount of time inside the Apostolic Palace, was the sudden appointment of homosexuals to positions of prestige and responsibility close to the Pope. 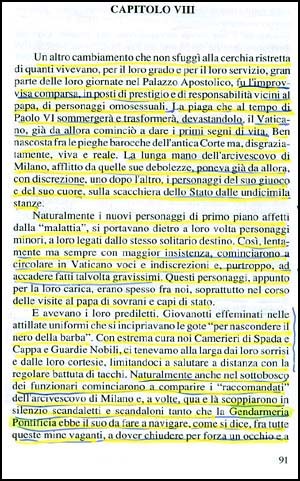 This plague that would infest, transform, and devastate the Vatican during the time of Paul VI had already begun then [in the pontificate of John XXIII], well hidden in the baroque curtain folds of the Pontifical Court, but unfortunately alive and real. It was the distant hand of the Archbishop of Milan [Cardinal Montini], himself a victim of such weaknesses, that discreetly placed one after another on the State chessboard - the pieces of the game dear to his heart. Those highly situated new personages, who were contaminated by the same "sickness," naturally brought with them other less highly placed people of the same ilk. So, slowly but continuously, rumors and indiscretions began to flow in the Vatican, and grave facts began to occur as a matter of course. Because of their functions, these people were often seen by us [chamberlains and noble guards] principally during the visits of Sovereigns and heads of State to the Pope. They also had their favorites, who were the effeminate young men wearing elegant uniforms and make-up on their faces to dissimulate their beards. We – the camarieri di spada e cappa and noble guards – carefully kept our distance from their smiles and courtesies. We limited ourselves to greeting them at distance with a military salute of the heels. Honorable old employees who relied on the Governatorato [the administration of the Vatican State] were, without any apparent reason, ordered to retire or sent elsewhere, and these newcomers were installed in their empty chairs, all them carrying in their pockets letters of recommendation from Cardinal Montini.